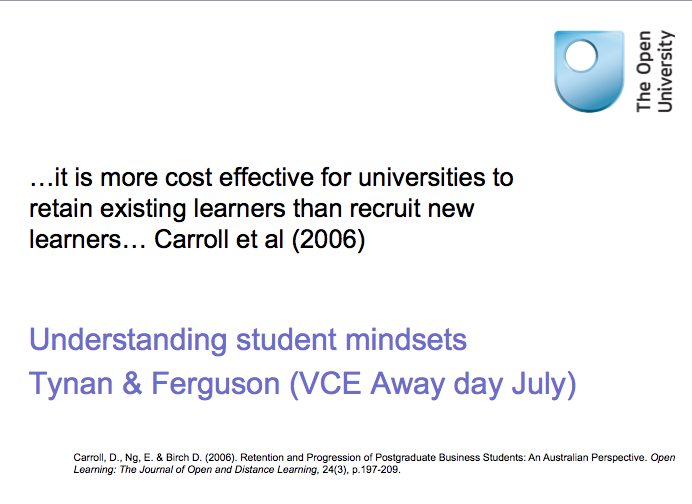 At the beginning of July, working with one of our pro-vice chancellors, I presented to our vice chancellor’s executive (VCE) about understanding student mindsets. We made the links between mindsets and learner persistence. Keeping students on board is a two-way process, universities retain and learners persist. This is where mindsets come into the picture. How can we help our students to develop persistence and resilience; how can we help them to understand that ability is not innate but is the outcome of focused work, and how can we help them to develop a deep approach to study? Research shows that it is possible to change mindsets, but to do so across a university requires systemic change. This entry was posted on July 23, 2014, 11:03 am and is filed under Educational Futures, Esteem, Events. You can follow any responses to this entry through RSS 2.0. You can leave a response, or trackback from your own site.